So you’ve noticed something unacceptable about your dog. It has behavior issues. Maybe it keeps strolling into the kitchen and helping itself with your dinner. Perhaps the dog just can’t keep quiet, constantly barking itself hoarse. It might be as extreme as constant aggression caused by nothing in particular. This has to be nipped in the bud and the best thing to do is to embark on a dog training project. Enter the lifesaving dog training collars, products meant to help you achieve the very arduous task of dog training. Mercifully, there’s an abundance of training collars in the market with numerous features to help you instill good behavior in your dog. But how do you know which are the best dog training collars? The collars come as a package of a transmitter remote control used to relay signals to a receiving unit, strapped onto the dog’s collar. These two communicate over a certain distance. That’s the first thing you’ll need to consider. What’s the signal range? A range of 330 yards or about 1000 feet is good enough for outdoor training. Next, the receiver units normally relay the signals to the dog via different modes. There’s the tone mode, vibration mode and static shock mode. Figure out how many modes the dog collar has and the levels available for each. Dog owners are normally discouraged from using the static shock mode unless it’s really necessary. Some collars are made to be waterproof. There are those that are only slightly water proof then there are others which are water resistant. If your dog likes to swim then get those that are 100% waterproof. However, it’s advisable to get a collar which at least has a level of water resistance to keep it safe during those unpredictable downpours. Finally, as with all other devices, the warranty is something to be taken into account. Some manufacturers offer 2 years warranty, others will offer 5 years while there those that offer a lifetime warranty. It’s always important to have a good warranty offer in case the device malfunctions out of the blue. We’ve put together a review of five of the most popular collars. 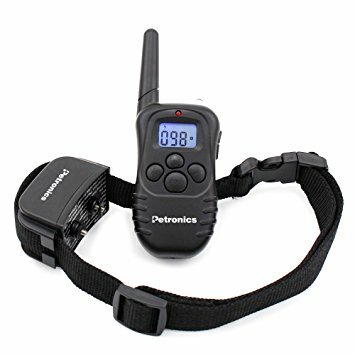 Opening our dog training collar review is this product from Petrainer Company, It’s the Petrainer PET998DBB2 dog shock collar. And just like the name suggests, it’s a perfect device to use when training your dog. Indeed, if your dog has issues with unnecessary barking or it perhaps is overly aggressive then you’ll find this training collar to be quite handy. The package consists of two collars and a remote control so you can train two dogs at the same time. The transmitter is a portable, compact device that’s utterly simple to use. The front face has four buttons each clearly labeled for the user. To the right side, there are up and down buttons to help navigate the menu. At the very top, there’s an LED light, flanked by the remote’s antenna. The collars, on the other hand, basically hold the receiver units. These units are responsible for relaying the commands via three modes. There’s a beep mode, which is a basic but audible beep. There’s the vibration mode which gives the dog a good nudge and then there’s the big gun, the static shock mode. With a communication range between the transmitter and receivers of 330 yards, training your dog in the park or anywhere outdoors, is an enjoyable experience. And coupled with the fact that the collars are waterproof, you won’t have to worry when it starts raining. However, these units can only withstand 0.7 liters of water per minute so a swim might render them damaged. Powering the transmitter and receivers are rechargeable lithium batteries. So, yes, you won’t need to keep buying replacement batteries every so often. Just plug the units in when they begin running out of juice. Next on our list is the Pet Tech training collar. This collar was designed to ease the dog training collar. Whether you’re a first-time dog owner or are an expert in the world of dog training, the Pet Tech will serve you impeccably. It’s perfect for correcting barking, training your dog for the leash or just improving behavioral obedience. And since Pet Tech offers complimentary dog training assistance via email, you’ll get your dog at its best behavior in no time at all. 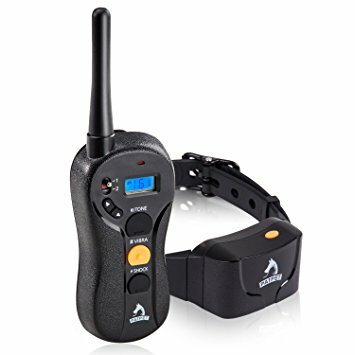 The package consists of a remote transmitter and a single receiver on the dog collar. The transmitter is a compact device, designed to fit right in the palm of your hands. The sides are textured to enhance your grip. However, this doesn’t compromise on comfort at all. The front face consists of the LCD display and four buttons. The display is illuminated by a blue backlight making it very clear. And to the right side, there’s a menu navigation button. The collar consists of a receiver unit which relays the commands in the form of four different modes. You have the static shock mode, the vibration mode and the tone/ beep mode. Each of these modes can be customized to different levels from 1 to 100. Then, to powering the units are lithium ion batteries which are rechargeable, of course. Petronics joins the fray with their amazing dog training collar. And just like the others reviewed above, it makes the job of correcting your dog’s behavior so much easier. Everyone from beginners to experts enjoys owning and using this collar. So what does this collar have to offer? 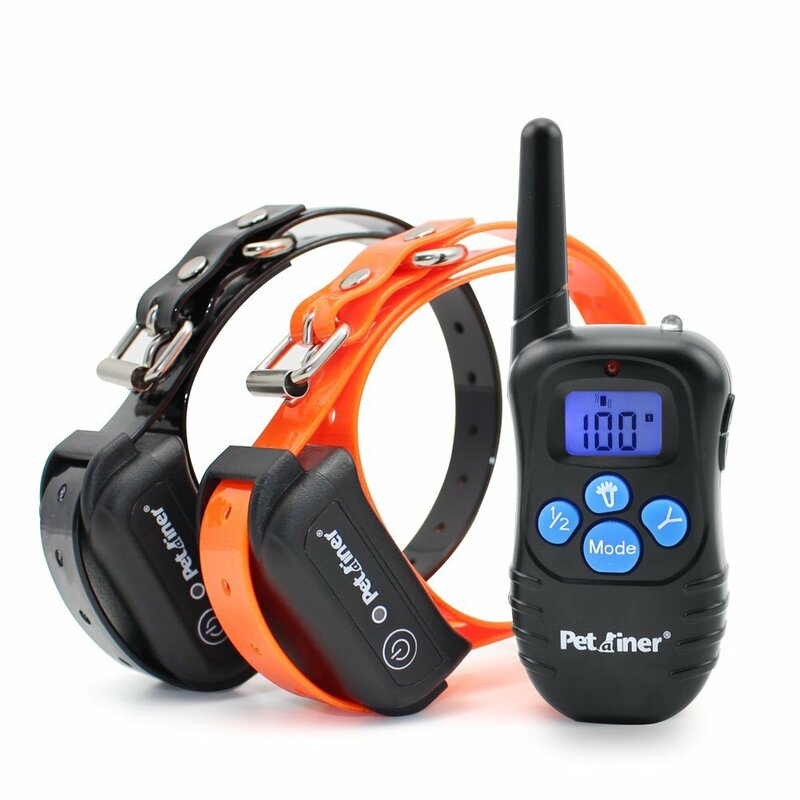 First of all, the product consists of a transmitting remote control unit and a receiver unit attached to the collar. The two devices communicate at a range of 330 yards so training your dog outdoors will be a breeze. The collar is adjustable to accommodate dogs of all sizes. You can shift its length from 14 to 23 inches without a hassle. The transmitter remote control bears a striking resemblance to the other transmitters reviewed. It’s a small device that’s ergonomically designed to fit the palm of your hands. And when you wrap your hand around it, you’ll feel the comfort thanks to the textured sides and the well thought out curves. The front face consists of the familiar four control buttons placed underneath the LCD display. To the side, you’ll find the up and down navigation buttons and at the top, there’s an LED light placed side by side with the antenna. 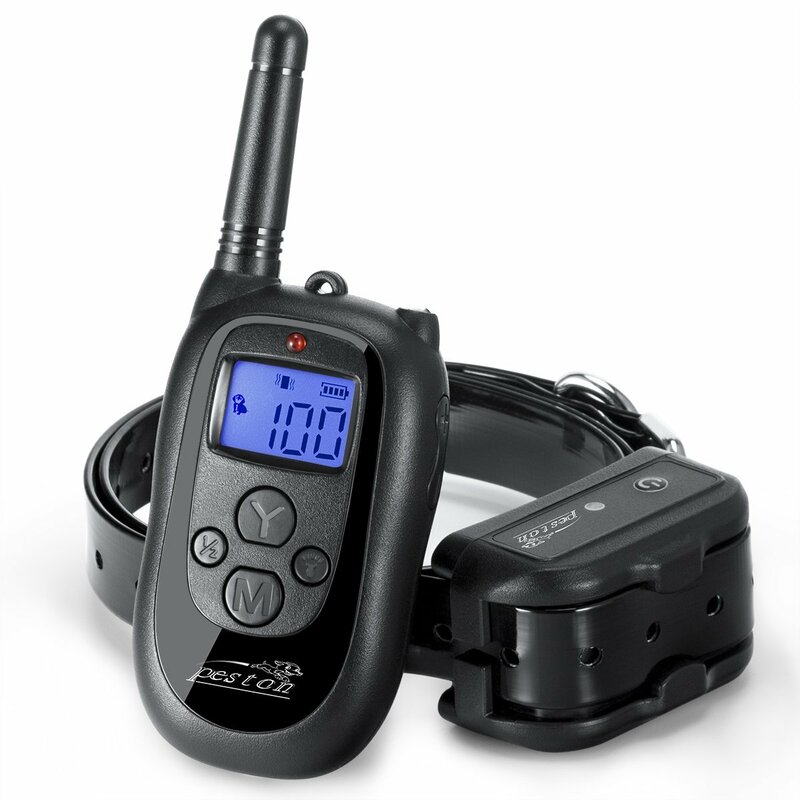 With three different modes of tone, vibration and static shock, you’ll be able to easily send commands to your dog. However, you don’t need to worry about causing harm to the dog as the shock feature is totally safe. Powering the units are rechargeable lithium batteries. Patpet Company brings to us this handy dog training collar. Earning its place in this review, it’s perfect for behavior training for anyone from beginners to experts. Just like the others, it’s simple to use and gets the job done. This Patpet product consists of a transmitter and receiver unit. The transmitter remote is made up of three main buttons placed on the front face. These are the mode selection buttons; beep, vibration and static shock. Above these is the LCD display and next to this tiny screen are the channel button and up and down buttons. The receiver unit, attached to the collar, is a simple device that relays commands made from the transmitter. Their communication is so seamless, they remain connected to each other within a range of 1960 feet or 660 yards. The collar is made to be waterproof. Now, this isn’t a basic waterproofing. It’s IPX7 Water resistant meaning there’s no cause to worry when your dog jumps into a pool of water. Still, the collar size is adjustable from 10 to 21 inches meaning it can fit dogs of all sizes. The transmitter can work with up to two collars, however, you’ll need to buy the extra collar for your second dog. And powered by rechargeable lithium ion batteries, the Patpet dog training collar remains on for much longer. Peston close our dog collar review. It’s a beautifully designed, small, black transmitter and receiver package. Both units bear a striking resemblance to the other dog collar products however, Peston tweaked their design a little bit and made theirs smaller and more portable. The transmitter remote control easily fits in the palm of your hand or in your pocket. The front face bears the now familiar four buttons, each clearly labeled. The right side has the up and down navigation buttons. The LCD display is large enough with a blue backlight to enhance visibility. 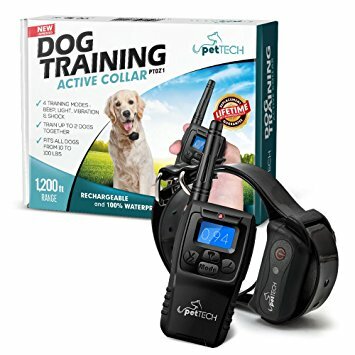 The collar, on the other hand, is made up of the receiver unit which picks up signals sent to it from the transmitter up to a distance of 1000 feet. The best thing about this unit is that it’s made to be 100% waterproof. So a swim by your dog won’t cause it any damage whatsoever. Powered by Li-poly batteries, both the transmitter and receiver will remain activated for much longer. And when the power begins to run low, they can be quickly recharged thanks to the rapid charging feature. All the dog collars above are perfect for anyone from first-time dog owners to the seasoned trainers. They are painless to use and comfortable for the dog to wear. Add on extra features like water resistance and you have excellent products in your hands. However, there is one that stands out from the rest. It takes the crown because of its cost and durability. And the fact that it comes with two collars right out of the box gives it the edge. 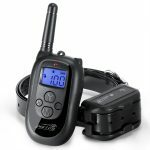 I’m talking about the Petrainer Pet998dbb2 Dog Shock Collar. Why Cats Meow At Night?